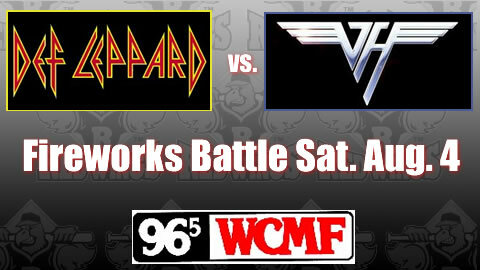 96.5 WCMF, Rochester's Classic Rock, gave you a voice in our epic Saturday, Aug. 4 rock and roll fireworks battle: Def Leppard vs. Van Halen, right after the Empire State Yankees play the Indianapolis Indians here at Frontier Field. The August 4 fireworks show will light up the sky, while rocking to a soundtrack of tunes of two of rock music's most powerful home run hitters. CMF listeners helped to select the fireworks show finale song for each band. As part of the voting, CMF listener Steve LaPlaca won a 4-pack of premium tickets to the Saturday, August 4th game along with dinner for 4, VIP parking for one vehicle, name recognition on the Frontier Field video board, and the opportunity to throw out the first pitch, along with "Christian" Dan Borrello from The Break Room! And while we'll never know if Phil Collen could wipe the floor with Eddie V (although we suspect he could), we DO know our Aug. 4 Def Lep vs. VH fireworks show will ROCK! The Rochester Red Wings are the Triple-A affiliate of the Minnesota Twins. The Red Wings are operated by Rochester Community Baseball, Inc. and have been a community-owned pro baseball franchise since 1957; Rochester's pro baseball history dates back to 1885. The Red Wings and Frontier Field have been selected to host the New York Yankees' Triple-A Scranton/Wilkes-Barre club for 37 games in 2012, while the Scranton ballpark undergoes major renovations. Wings fans will benefit from eight additional Red Wings vs. Yankees games here, plus 29 more games featuring top Yankees prospects against other International League clubs.